Vermont is made up of communities that care about each other and our beautiful surroundings. It comes from our respect for the past combined with a passion for a sustainable future. It’s about taking care of what we have and innovating new products and services that help us shape that future. This is what will enable Vermont to creatively respond to the defining issue of our time – climate change. If we apply Vermont’s special qualities to the challenge of climate change, we can flip the conversation on its head, and see it as a remarkable opportunity –a n opportunity to build a climate economy. What does this mean? In contrast to the desperate climate denials made by the White House, it means that we can build an economy that focuses on identifying solutions to this challenge. Over my career in international development, I’ve worked collaboratively with policymakers across five continents on core issues of sustainable economic development. There is a global race to find creative solutions to both the causes and the impacts of climate change, and I believe Vermont has what it takes to be a leader. Because we are small and nimble, we can make change happen and demonstrate solutions in public policy and in business innovation. Vermont has key assets that position us well to take this lead. With Vermont’s bold state energy plan, higher education expertise, innovative utilities and strong business leadership, we have a powerful story to tell. This story can celebrate and reinforce current efforts while growing and attracting a new generation of creative businesses that want to be at the center of this climate economy, helping us create jobs, preserve our high quality of life and our beautiful surroundings. How does this happen? A climate economy focuses on building key sectors and the jobs that go with it. These include clean energy, thermal and electrical efficiency, sustainable transportation, working lands, local food and local energy, smart growth development and the technologies that help us leapfrog into the next generation of solutions. 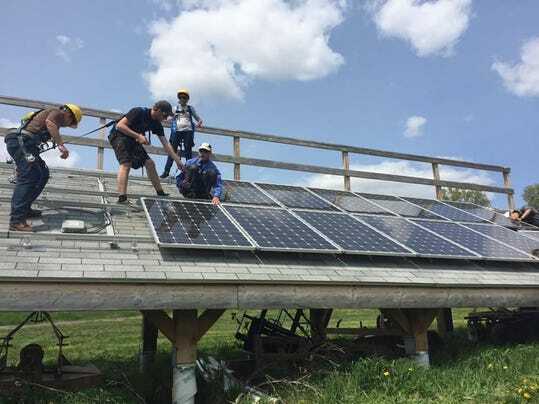 A climate economy seeks to help all Vermonters benefit from moving away from fossil fuels and protecting them from the impacts of climate change, while attracting new generations of young people who want to be part of the solution. Ultimately, the climate economy is the economy of the future. With national leaders’ head-in-the-sand stance on climate change, it will be up to the states to assume leadership. Vermont has a long proud history of firsts. From outlawing slavery to passing legislation legalizing civil unions and gay marriage, from banning fracking to developing the nation’s first efficiency utility, our state has never been afraid to lead. The Vermont brand, and all the state stands for, gives us an edge. We now need to seize the opportunity to make a difference on climate change. People are attracted to Vermont because it has always combined quality of life with respect for our environment, honoring the past while celebrating the future. From Ben & Jerry’s to 7th Generation to the nation’s first utility to become a B-Corps (GMP), we see that entrepreneurial businesses can do well by honoring the triple bottom line: people, planet and profit. From energy policies that have helped hundreds of schools and municipalities save taxpayer dollars through efficiency, going solar and wood pellet systems, we see how a renewable energy transition helps save money and create local jobs. From ski resorts like Killington that run lifts on Cowpower to Darn Tough socks that last forever, we see that quirky and innovative can be cool and sustainable. From the country’s top-rated environmental law school (Vermont Law School) to UVM’s Sustainable Entrepreneurship MBA program and the Gund Institute for the Environment, we know that training the next generation matters. We already have all the puzzle pieces. Let’s now put them together and become the first state to build a climate economy. Linda McGinnis, of South Burlington, is program director for the Energy Action Network.